Chula Cholula, drag queen, chef extraordinaire and owner of PICO DE GALLO restaurant, returns in a completely brand new show! Chula is getting married and everyone’s invited! Meet the crazy participants, friends, and relatives, as we embark on a journey that takes Chula to the altar! This time around the theme of LOVE takes the stage as the key ingredient to this new recipe! The COMEDY CON SPICE is back with all new characters and continuing in the spicy spirit that defines the PICO DE GALLO shows! "Fall down funny...the brightest burst of comedy on any stage this summer!" "...the laughs cascade like guppies over Niagara Falls." The Original PICO DE GALLO: THE COMEDY CON SPICE! Pico de Gallo: The Comedy con Spice! by Oscar Contreras, Marco Rodriguez, Christopher Espinosa and Israel Luna, was a brand new sketch comedy / cabaret / singing show dealing with the “Melting Pot” in United States and how food brings all our different cultures together. Pico de Gallo was written, directed and produced by local Latino talent and starred a multi-cultural cast. Pico de Gallo was written specifically to raise money for La Lupe: My Life, My Destiny. Martice wanted a little show of their own to keep costs low in order to raise funds for La Lupe. They met with the writers to discuss what the show was going to be about. There was only one idea on the table. The show was going to feature a drag queen as the main character. Enter the writers: Chris Espinosa is a comedian/writer founder of Sky Rocket Press and Israel Luna is a screenwriter/director founder of La Luna Entertainment, a film production company. Marco Rodriguez is Martice's co-producer/actor and Oscar Contreras is a director/actor that had written a few short stories before, but had never been produced. Pico de Gallo was Marco Rodriguez and Oscar Contreras' writing debut. Pico de Gallo was also Oscar Contreras' directorial debut. To Martice's delight, Pico de Gallo was a hit, with sold-out shows and critical acclaim. Martice developed a Christmas version of Pico de Gallo, which performed for one night on December 11 2003. Martice has also performed Pico de Gallo for Southern Methodist University, FDIC and Hispanic Women's Network. 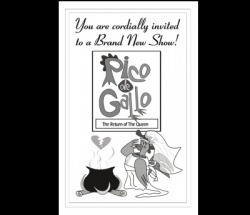 Pico de Gallo II: The Return of the Queen!